Porto Novo is a great City with a great history. It is the capital of Benin republic and is situated on the West African Coast. The word Porto Novo is a Portuguese word which means New port. The Portuguese were the first European to settle down there. Porto Novo is also known as Ajase (Ajace) by the Yorubas, and known as Hogbonu by the Ogu. Porto Novo was established in the 16th Century. It was a Slave port controlled by the Alaafin of Oyo. The Oyo Empire was a great empire which also controlled the Slave port of Badagry. It partly controlled the Slave port of Whydah (Ouidah) for a period before Whydah was completely taken over by the Dahomey Kings. There are many Black returnees who returned from Brazil and settled in Porto Novo. The Parliament building is in Porto Novo. It is in the Oueme department. The City is governed by a Mayor. Porto Novo is the official Capital of Benin Republic. The City was the Capital of old French Dahomey. The Commune covers an area of 110 Square Kilometers. Palm Oil, Cotton, and Kapok are produced in large quantities in Porto Novo. Petroleum was discovered at the Coast of Porto Novo in the 1990s. On August 1, 1960, the republic of Dahomey (BENIN) gained full independence. 1863- The British bombarded Porto Novo because of continuous Slave trading activities and possibility of control. 1883- Porto Novo was incorporated into the French ''Colony of Dahomey and it's dependencies''. 1885- The last Portuguese Slave Ship departed from the Coast of present day Benin republic. 1892- The French took over Porto Novo the area. 1899- The French included the land called Dahomey into the French West African Colony. 1900- Porto Novo became the capital of Dahomey. 1908- The king of Porto Novo held the title Chef Superieur. 1960- REPUBLIC OF DAHOMEY (Benin) gained independence. 1991- Mathieu Kerekou became the first Black African to step down after an election. He was defeated by Nicephore Soglo. 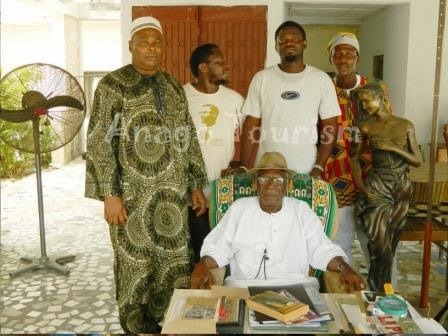 The History of Seriki Williams Abass of Badagry and his Brazilian Barracoon By Anago James Akeem Osho Seriki Williams Abass was born originally at a town in Yorubaland called Ijoga Orile. The town is in todays Ogun State in South West Nigeria. Ijoga Orile is not far from Ilaro and Abeokuta. His birth name was Faremilekun and his father’s name was Fagbemi. He was captured by the Dahomeans and became a slave at the age of six years old. The country called Benin Republic today used to be known as Dahomey. The name Dahomey was changed to Benin Republic in 1975.